Japanese website Mac Otakara has been stoking the rumor fire again today, claiming that Apple will hold a March 2017 event during which new iPad Pros will be unveiled alongside new iPhone SE configurations as well as an all-new iPhone 7 and iPhone 7 Plus color option. As the rumor goes, the event will mainly focus on the iPad Pro, with the whole lineup set to receive a refresh while new sizes will also be added to the mix. While the existing 9.7-inch and 12.9-inch iPad Pros will receive updates, Apple will also add a Pro tablet in 7.9-inch and 10.5-inch flavors, with the latter expected to feature a button-less display, similar to that of the also rumored iPhone 8. Should that be the case, this new 10.5-inch iPad Pro will likely have physical dimensions which closely resemble the 9.7-inch iPads. Alongside iPad Pro updates, the rumor also suggests that the iPhone SE will see its capacity options increase, with a 128GB iPhone added to the mix – the iPhone SE is currently available in 16GB and 64GB variations. Staying on with the iPhone for a moment, Mac Otakara also believes that the iPhone 7 and iPhone 7 Plus will gain a new red color option, although the same website did previously believe that such a color would first debut as part of the iPhone 7 and iPhone 7s launch. As for the Apple Watch, it is believed that a fresh of the wearable’s watch bands and straps will also take place during the event, as also happened last year. If all these new iPads and iPhones do come to fruition, the publication does not confirm when they will be ready to ship, although the all-new 10.5-inch iPad Pro is not expected to be ready for prime time until May. Lookout – If Apple do in fact release a red iPhone – guaranteed 100% that Shamesung will also release a red phone! Because Apple discovered the colour red and anyone who uses it is a shameless copycat. 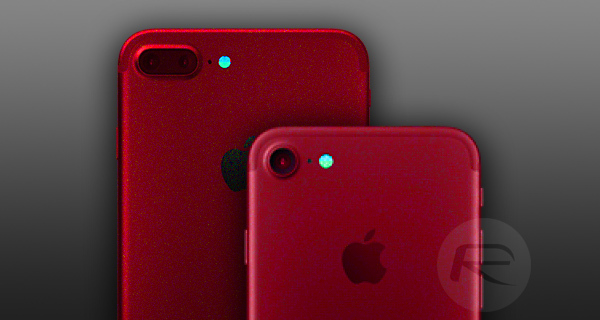 Let’s forget all previous phones that were red. It’s all to do with timing Weisse. Apple may not be the first to do something, but if it’s successful in any way, Shamesung copy it asap. Aaaaaaand here come the red Samsungs.